i. John Faulring John was born on December 9, 186869, and he died on July 1, 192410. John married Anna Pfarner. ii. Frederick D. Faulring Frederick was born on January 27, 18709, and he died on January 2, 194910. Frederick married Agnes S. Clint. iii. Mary Margaret Faulring Mary was born on January 1, 18724, and she died on July 4, 19374. Mary married (1) George Pfarner and (2) Georgem Weisser. iv. John Ferdinand Faulring Ferdinand was born on September 4, 187310, and he died on May 6, 193710. Ferdinand married Clara Klein. v. Christian Edward Faulring Christain was born on March 14, 18764, and he died on January 14, 195110. Christian married Bertha Smith. vi. William Casper Faulring William was born on June 4, 18784, and he died on March 7, 194410. William married (1) Matilda Demerley and (2) Emma Kohn. vii. Bertha Louise Faulring Bertha was born on March 28, 18814, and she died on June 5, 193310. Bertha married William Pfarner. viii. George Albert Faulring George was born on April 9, 18849, and he died on March 22, 194710. George married Alice Needham. Seated: John, Barbara Faulring Burr, Fred, Mary and Ferd. Standing: William, Bertha, George and Christ. Johann Caspar Faulring was born on January 27, 18398, in Moggenbrunn, the eighth child of Johann Friedrich Faulring and Anna Margaretha Zapf. He was baptized on February 17, 1839, at St. Laurentius Church in Meeder, Saxony Coburg-Gotha8. His first fifteen years were spent in Moggenbrunn with his parents, during which time he received any early education and undoubtedly worked in the family farm. In 1854, shortly after his 15th birthday, Casper accompanied his family on the journey to America, where they settled on a farm in Concord, New York. There, he continued his farm life. The extent of his education is unknown. In June of 1866, Casper purchased two parcels of land on Brown Hill Road, in the town of Concord7. About a year later, he sold a half-interest in this land to his brother John7. It would be around the time of this sale that Casper met Barbara Forster, who had recently relocated to Springville, New York. 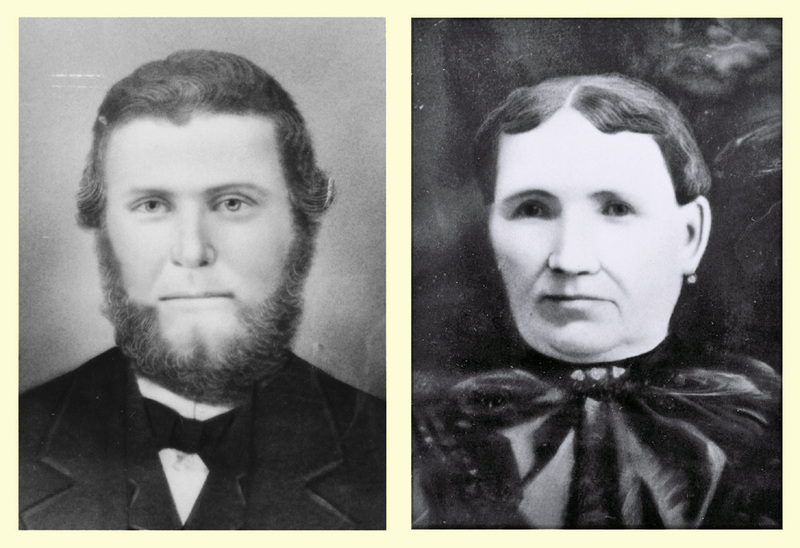 They were married on March 1, 18689, and settled on his farm, where they began raising their family. By 1880, Casper and family were living on his father's land, which he continued to farm until his death a few years later11. On March 19, 1886, two years after the birth of his last child, Casper was found setting in a chair dead of an apparent suicide from an overdose of morphine12. Nothing we know today sheds light on why Casper took his own life. 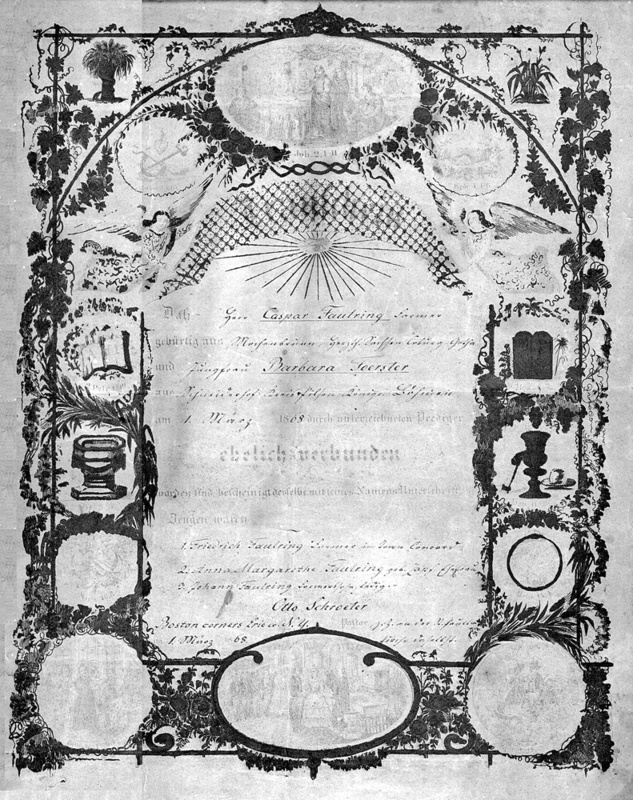 As shown by her certificate of marriage, Barbara Foerster was born in Schneiderhof, Kingdom of Bohemia, a small village on the border between Bohemia and Bavaria. Her obituary gives her birth date as November 10, 184213. Schneiderhof was a rural farming settledment on the western foothills of the mountains of Bohemia (now part of the Czech Republic), very close to the border with Germany. This area was part of Sudetenland, which had a large German population and which was annex by Hitler just prior to WWII. Following the War, the border area became part of the Iron Curtain and Schneiderhof and was ordered abandoned by the Czechoslovak government to create a buffer zone with Germany. Very liitle remains of the small village. 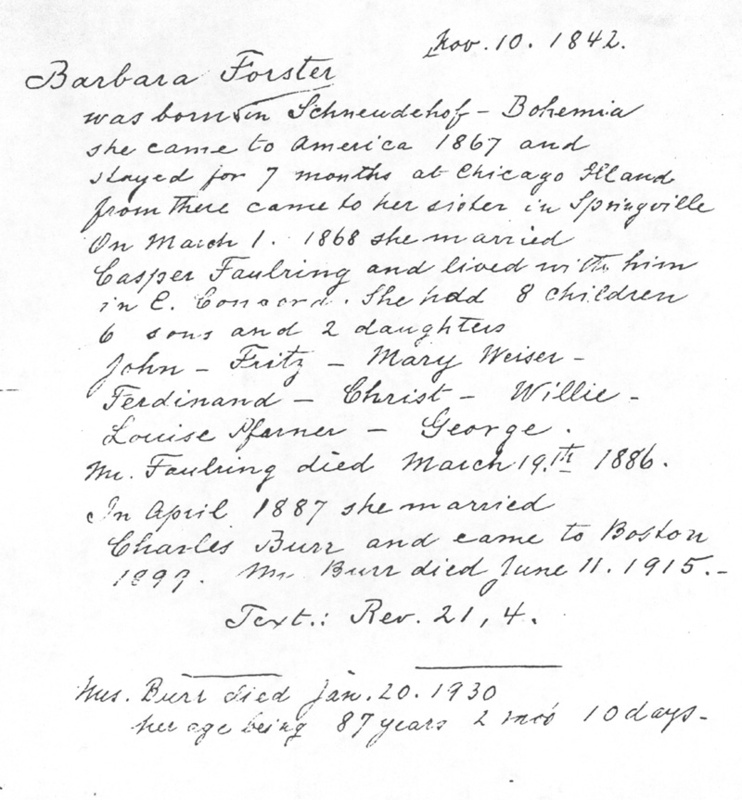 The marriage certificate also gives the spelling of Barbara'a name, Foester. This is equivalant to Förter, which is German for Forester, suggesting her family's occupation. This is our only information concerning her ancestry, due to the absence of records. Barbara came to America in 1867 and initially settled in Chicago, Illinois. Shortly, however, she moved to Springville, Erie County, New York, where her sister lived. It is there that she met and married Casper Faulring. This suggests that Barbara's sister may have been Rosa Foster, the wife of Peter Faulring, since the Foerster name was typically changed to Forster or Foster in America. After the death of Casper, Barbara married Charles Burr on April 12, 18874. (At the time remarriage was often a necessity for a widow with several children.) 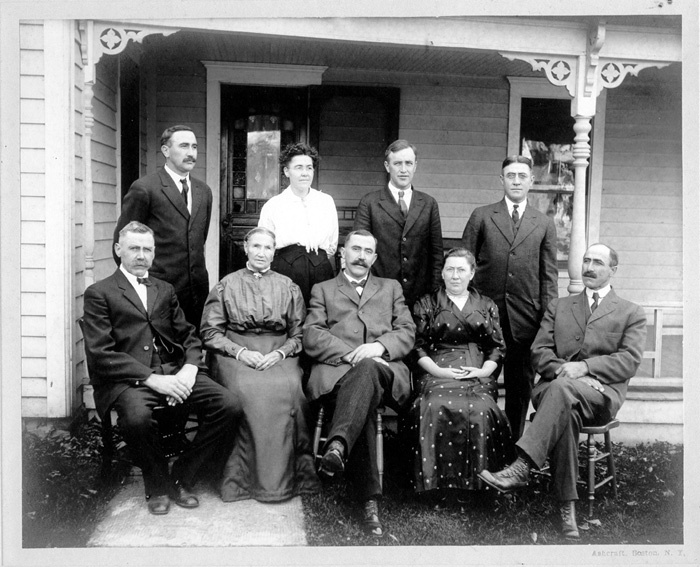 The Burrs lived in the Town of Concord until 1896, when they moved to Boston where Charles worked as a farm laborer. Charles Burr died on January 11, 191510. Barbara lived an additional fifteen years and died on January 20, 19304.